He acknowledged that the allegations by his siblings challenge the values of a cohesive, multi-racial, meritocratic, fair and just society, where the same rules apply to everybody. He emphasised that whoever you are, you are not above the law. But PM Lee seemed to contradict himself that no one is above the law when he had to address questions as to why he has not sued his siblings for defamation over their accusations. He said that he would sue anyone who had made such grave attacks on him, but that suing his siblings was not his preferred choice for the sake of his parents. PM Lee has sued several over the years for defamation – the latest being Roy Ngerng in 2015. Responding to reports that PM Lee would not be suing his siblings over the serious allegations that they made, one Facebook page said: “Too bad Roy Ngerng is not one of PM Lee’s siblings”. 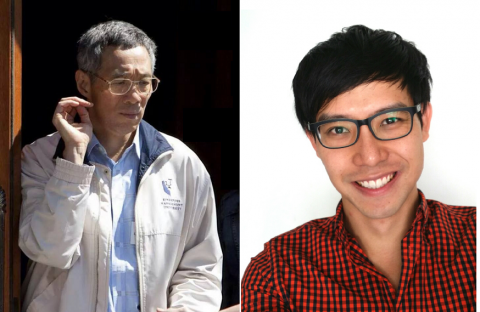 Should Roy Ngerng seek a refund for defamation damages paid to PM Lee? 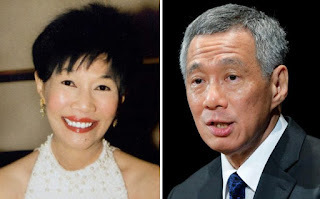 A lingering question that some may have with the ongoing Lee family saga on social media is whether Mr Lee Hsien Loong, the current Prime Minister of Singapore, will sue his two siblings for making “unfortunate allegations” of him and the “absurd claim” that the PM has political ambitions for his son, Lee Hong Yi. Mr Lee Hsien Yang has even alleged that Ms Ho Ching, wife of PM Lee committed theft by taking documents of late Lee Kuan Yew when he was hospitalised. Political leaders from the People’s Action Party are known for filing defamation suits against critics, especially political opponents who make allegations. PAP leaders have stated that it is a must for allegers to be sued so that their accusations can be disproven in court. 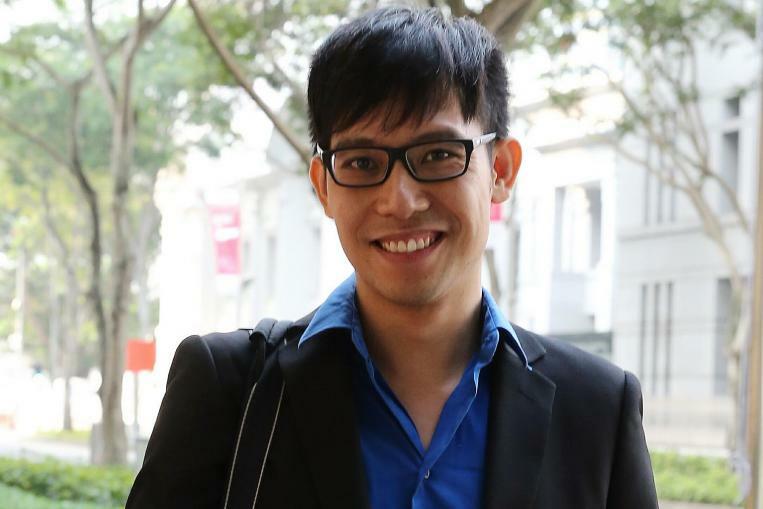 Roy Ngerng was sued by PM Lee for defamation in 2015. Too bad he isn't a sibling of PM Lee. What would Lee Kuan Yew have done? Indeed, PM Lee is no stranger to initiating defamation suits. Take Roy Ngerng for example. Roy Ngerng wasn’t someone who was particularly influential nor were the things he wrote widely read. And even those who read his stuff take it with enough salt to give you instant kidney failure. Yet, PM Lee though it necessary to sue Roy Ngerng. Why? Because if PM hadn’t done so, then there is a possibility that some foreign institutions (e.g. governments, MNCs) may actually believe that there is a nugget, however small, of truth in what Roy Ngerng had said. And now, we have two of Lee Kuan Yew’s children accusing his eldest child, who also happens to be the Prime Minister of Singapore, of nepotism and abusing power for personal gain. 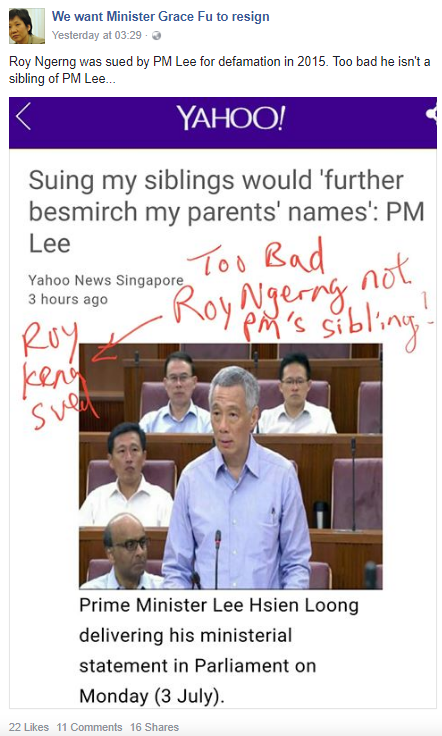 PM Lee’s siblings are far more influential than Roy Ngerng. Surely their allegations must be met with an equally, if not more, robust response than Roy Ngerng’s. Surely, if we applied the same principle that Lee Kuan Yew held in similar instances, PM Lee needs to act decisively to publicly prove that those allegations are baseless. Open official inquiry to clear up all doubts on Lee family saga? More importantly, is PM Lee going to sue his siblings for defamation? Many before them have been bankrupted for saying far less! I am not suggesting that they be sued. All I am saying is that it shouldn’t be different rules for different folks because that would be acknowledging that cronyism does exist! Something that is bad for stability and government reputation! Alternatively, is PM Lee’s government going to offer ratification and a full apology to those who have faced the defamation suit before? If he doesn’t take action against his siblings, he will run the risk of tacitly acknowledging that those before them have been wrongfully penalised. Again, something that affects government standing! Reporters without Borders (RSF) yesterday (April 22) published a damning report on Singapore’s press freedom with specific reference to the political persecution of The Real Singapore and defamation suit against Roy Ngerng. RSF lambaste Singapore’s censorship board, the Media Devlopment Authority (MDA), and the country’s oppressive censorship laws for repressing journalism in Singapore. You may view the official statement here. 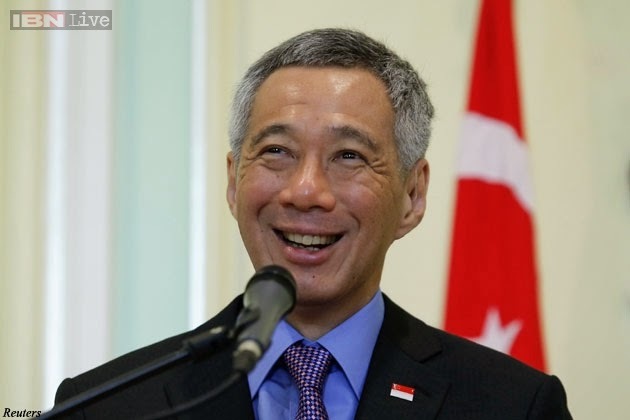 Earlier this year, Singapore Prime Minister Lee Hsien Loong was awarded S$150,000 in damages for a defamation lawsuit he won in a default judgment against an online blogger who criticised him and his wife for conflict of interests. 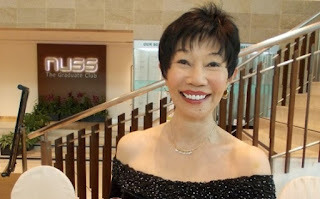 Lee Hsien Loong is both the Prime Minister and Chairman of the country’s sovereign wealth fund (SWF) company, GIC Pte Ltd. His wife, Ho Ching, is the CEO of Singapore’s other SWF company, Temasek Holdings. The two SWF companies borrow the country’s CPF fund at cheap interest rates as low as 2.5% under legislation approved by the Prime Minister himself, while reaping undisclosed profits from their investment returns. The decision of the High Court of Singapore ordering blogger Roy Ngerng to pay damages to Prime Minister Lee Hsien Loong following a civil defamation suit brought in 2014 constitutes a major blow for freedom of expression in the country, said the ICJ today. 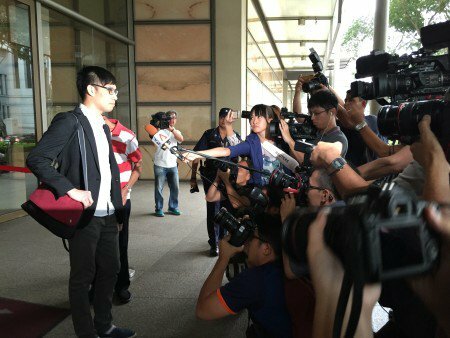 In a judgment released on 17 December 2015, the High Court ordered Roy Ngerng to pay SG$100,000 in general damages (approximately US$70,667) and SG$50,000 (approximately US$35,330) in aggravated damages. This decision comes approximately six months after a three-day hearing on assessment of damages took place. 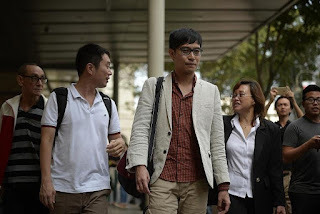 The Singapore High court today (Dec 17) ordered CPF blogger Roy Ngerng to pay Prime Minister Lee Hsien Loong S$150,000 for defamation. Roy Ngerng was found guilty in Oct 2014 for defaming Lee Hsien Loong in a default judgment, where there is no fair trial and contest over what’s defamatory. The article which the Prime Minister took offense was the one that drew similarities between Lee Hsien Loong’s PM position and his doomed investor wife’s, the CEO of the country’s sovereign wealth fund company Temasek Holdings, and the round tripping fraud Pastor Kong Hee of City Harvest Church used to siphon church funds to fund his wife’s doomed singing career. Other unrelated articles pertaining to CPF matters are also ordered to be taken down, which the Prime Minister claimed was defamatory as well. Sir, It was with much dismay that I read the report ‘Blogger ordered to pay PM 150k in damages’ in the Straits Times of 18 December 2015. I was less struck by the specifics of a court case that Singaporeans must have been following with great interest over the months – the standpoints taken by the contending parties, the various judicial processes, the assessment of damages to be paid to the plaintiff – than by one stark fact: once again, Sir, your powerful government is putting to use its most powerful instrument for silencing critics, namely, the defamation suit. This dreaded instrument that had been created in a past era to punish political opponents specifically and instil fear in the people generally, could not have appeared at a more inappropriate time. 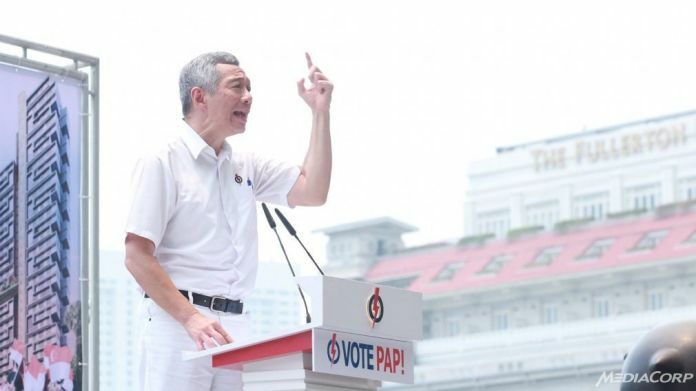 For this is supposedly a period of sweeping change and new connection with the people, following the PAP’s resounding victory in a highly fraught general election. Charged with new energy, the government has been engaged in a massive exercise of goodwill and generous giving to the people, firstly to consolidate and strengthen the support that they had given in the election, and secondly, to lead them, during this crucial period of transition, into a new era of PAP leadership that promises to be even better connected with their needs and aspirations. In such a celebratory climate of amity and unity, the continuing use of a political tool that Singaporeans have come to associate with the least attractive, nay, the most repulsive aspect of PAP rule, must surely inject a discordant note. What does all this mean? The usual PAP rejoinder in the past to any criticism of its harsh treatment of critics – “We cannot allow anyone to undermine trust in the government” – cannot be very convincing at a time when the landslide victory has given firm assurance of that trust and probably even ensured permanent PAP entrenchment in the political landscape. Indeed, the electoral victory of September 2015, with its warm afterglow that the PAP is still basking in , surely calls for the exact opposite of recrimination and punishment, namely, magnanimity. This special kind of response is all the more to be urged when the power differential between the victor and the loser – in this case, between the mighty PAP and a low-standing, obscure young person – is, without doubt, maximal. Magnanimity, whether pertaining to an ordinary individual or the highest governing authority, can manifest itself in a variety of forms along a wide spectrum of responses, from simple withdrawal of all threat of punishment, to open forgiveness, to the nobility of actually stretching out a helping hand to the adversary. Justice Lee: "The words of a dishevelled tramp in a street corner would be far less capable of causing damage than that of the CEO of a multi-national company." CPF blogger Roy Ngerng, 34, was ordered by the Supreme Court to pay S$150,000 in damages to Prime Minister Lee Hsien Loong for defamation. This comprises S$100,000 in general damages and S$50,000 in aggravated damages. S$150,000 in damages is considered low in the history of defamation law suits by political leaders in Singapore. For instance, the late JB Jeyaretnam lost defamation a suit over a Workers’ Party (WP) article in 1998 and was ordered to pay $265,000 (not adjusted for inflation). Blogger Roy Ngerng, who has been found to have defamed Prime Minister Lee Hsien Loong, issued another apology to PM Lee on his blog just after midnight on Friday. This apology came hours after a heated court hearing to assess damages Mr Ngerng has to pay Mr Lee, during which Mr Lee's lawyer, Senior Counsel Davinder Singh, pointed out that Mr Ngerng's act of republishing a letter of demand on his blog had amounted to perpetrating the defamatory content. This was because the letter had included phrases from the libellous article, as well as hyperlinks to third-party websites on which the article was reproduced in its entirety. Civil litigation in Singapore is expensive. Commencing a law suit in the High Court entails a minimum court fee of $500. An application for summary judgement costs $500 and every affidavit attracts a minimum fee of $50 with each page of an exhibit incurring another $2. In addition, electronic filing fees with service charge have to be paid. Everyone is entitled to sue if he feels aggrieved by someone. And anyone sued can defend himself if he feels that he is wronged. The court where one seeks justice is open to all and judges and all the court staff are paid by taxpayers. Accessibility to the courts is guaranteed to all who have the money to pay the required fees set out in the Rules of Court and electronic filing charges. But court fees are not the only costs that one should consider before commencing an action. Lawyers too have to be paid unless they offer their services pro bono or free. And lawyers’ fees do not come cheap in Singapore. A litigant has to pay the lawyer he engages and if he loses his claim, he has also to pay the lawyers of his opponents. As can be seen in the case of PM Lee Hsien Loong vs Roy Ngerng, the latter was ordered to pay $29,000 to PM Lee’s lawyers when they won the application for summary judgement. In addition, Roy Ngerng has also to pay S$6,000 for an unsuccessful application for the admission of a Queen’s Counsel. Blogger Roy Ngerng's court case for defaming the Prime Minister may attract "popular" interest, but this did not make it one involving "public" interest. The concepts are different, said Justice Steven Chong in decision grounds released yesterday on why he refused Mr Ngerng's request to hire a Queen's Counsel. After a court ruled last November that he had defamed PM Lee Hsien Loong, the 34-year-old blogger applied for British QC Heather Rogers, an expert in defamation law, to represent him in a hearing to assess how much damages he has to pay. A Singapore court has ordered a blogger to pay S$29,000 ($21,700) to Singapore Prime Minister Lee Hsien Loong as legal costs after Lee won a defamation case late last year. 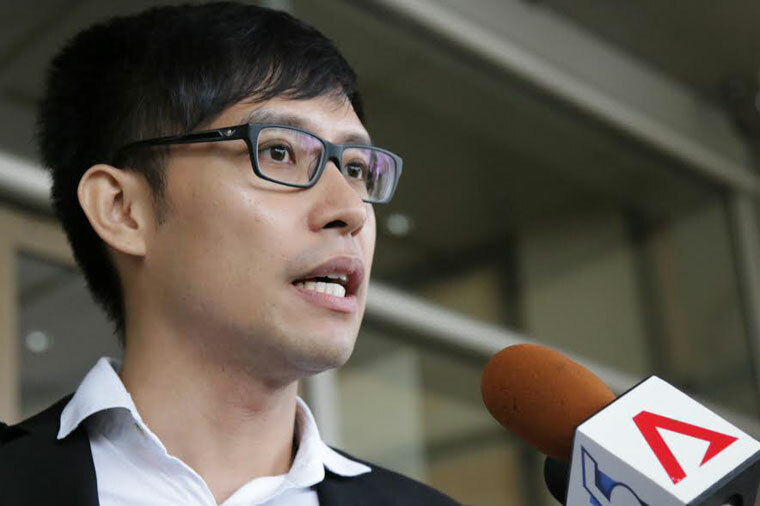 Lee won a High Court defamation case against blogger Roy Ngerng, 33, in November, the first time the city-state's leadersued an online critic. Ngerng was sued for his blog post in May when he was alleged to have implicated Lee in impropriety in connection with how funds in Singapore's mandatory retirement savings scheme, the Central Provident Fund(CPF), are managed. A blogger is facing legal action for alleging that CPF funds have been "misappropriated". 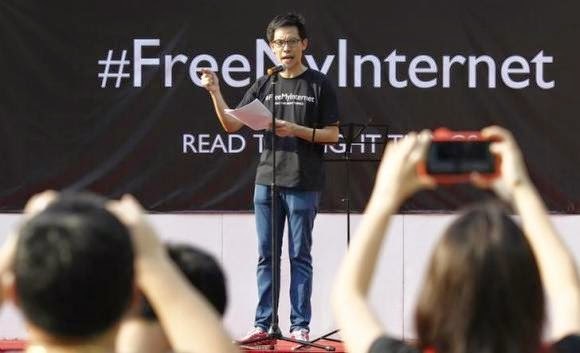 In a letter of demand sent through his lawyer to Mr Roy Ngerng of the website The Heart Truths, Prime Minister Lee Hsien Loong called for the blog post to be removed from Mr Ngerng's website and his Facebook pages. If he fails to do so, he could be sued for defamation. A Singaporean blogger accused by Prime Minister Lee Hsien Loong of defamation today offered compensation after initially refusing to do so, as the premier’s lawyer accused him of lacking contrition. “Our client proposes to offer Sg$5,000 (US$4,000) as damages to the Prime Minister,” Roy Ngerng Yi Ling’s legal counsel M. Ravi said in a letter to Lee’s lawyer. “The sum of Sg$5,000 is based on our client’s modest living and income that he derives from working as a healthcare worker,” Ravi wrote in the letter, released to the media. PM Lee Hsien Loong has rejected an appeal not to demand for damages and legal costs from blogger Roy Ngerng, according to his lawyer Senior Counsel Davinder Singh said in a letter on Friday. Ngerng now has until 5pm next Monday to send in a written offer failing which legal proceedings will be started against him. Earlier on Friday, Ngerng “unreservedly” apologized for a blogpost written last week which was considered defamatory to PM Lee. But the blogger's lawyer M Ravi dismissed the demand for compensation, while urging Lee not to seek damages. Blogger Roy Ngerng has removed a blog post accusing the Government of "misappropriating" CPF funds, a day after he was asked to do so by Prime Minister Lee Hsien Loong's lawyer. The health-care worker said he took down the blog post on Monday night, but is still deciding how he should respond to a letter of demand sent to him from Mr Lee's lawyer. Mr Ngerng said on Tuesday his lawyer M. Ravi would be meeting with Mr Lee's lawyers to discuss the issue. 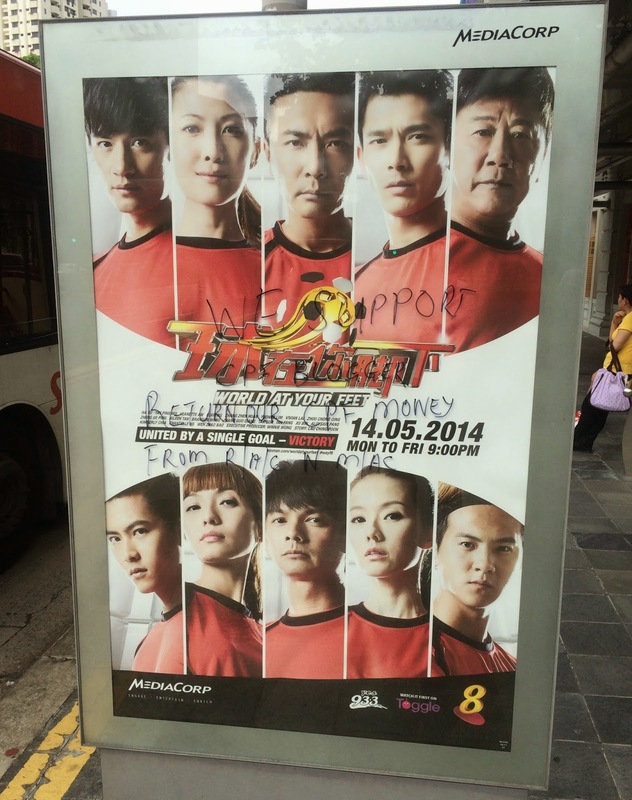 A string of vandalism cases has been occurring around Singapore with bus stops defaced with CPF related messages. 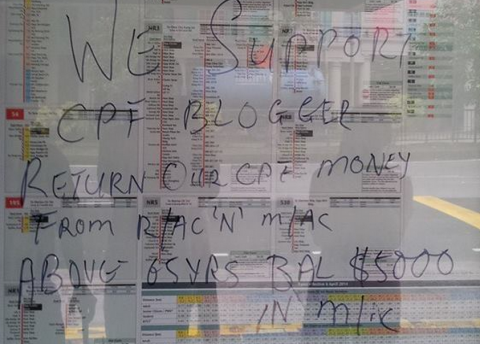 The message read "We Support CPF Blogger. 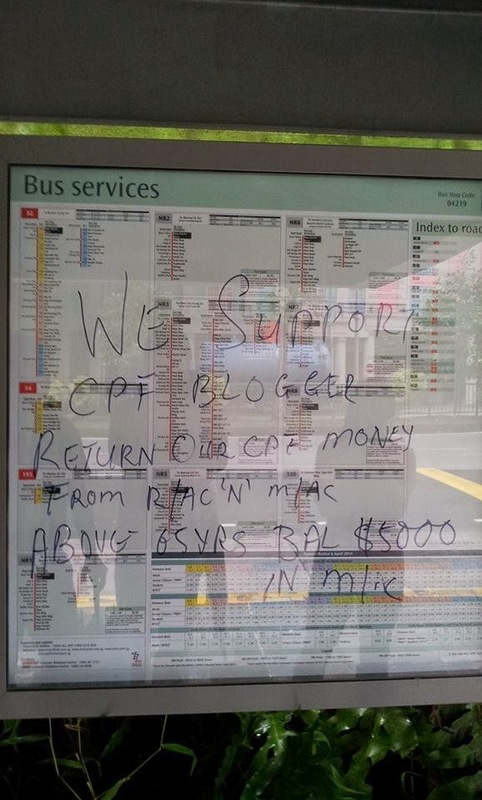 Return our CPF Money From R/AC 'N' M/AC"
The police are investigating a string of vandalism acts by apparent supporters of blogger Roy Ngerng, who was last week served a letter of demand for a post on May 15 alleging that Prime Minister Lee Hsien Loong had misappropriated Central Provident Fund (CPF) savings. Mr Ngerng apologised to PM Lee last Friday, and admitted that the allegation in his May 15 post is false and "completely without foundation". He added: "I unreservedly apologise to Mr Lee Hsien Loong for the distress and embarrassment caused to him by this allegation." 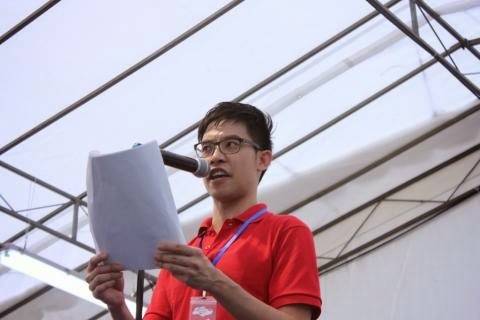 Political blogger Roy Ngerng on Wednesday morning announced a surprise bid for a Nominated Member of Parliament (NMP) position. 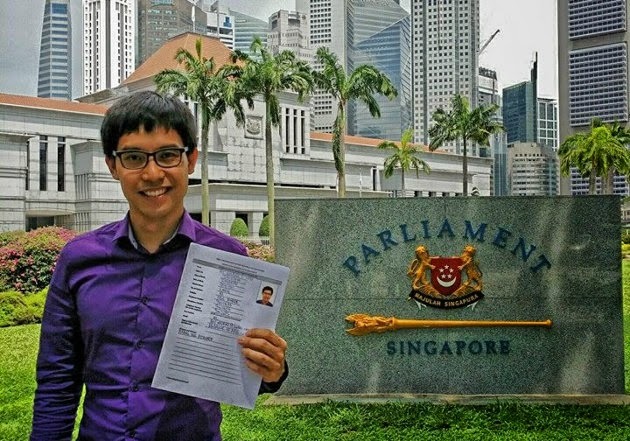 Taking to his Facebook page, the 33-year-old healthcare programme co-ordinator posted a picture of himself holding his proposal outside Parliament House, saying, "Looking forward to representing the voices of Singaporeans in Parliament. If I get selected!" The proposal, he said, was submitted by fellow blogger and activist Han Hui Hui, who previously took on Singapore's Council for Private Education over issues relating to private schools she attended. 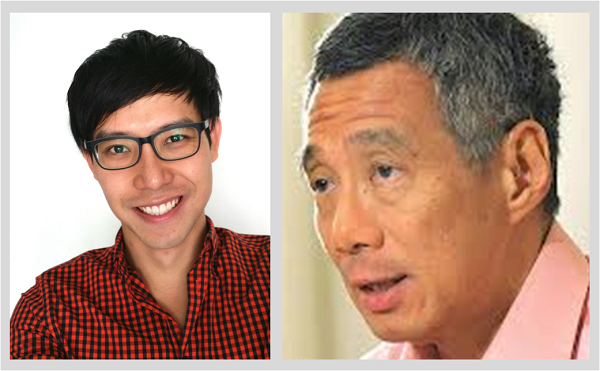 PRIME Minister Lee Hsien Loong has demanded an apology and compensation from blogger Roy Ngerng Yi Ling, 33, for a post that alleges Central Provident Fund (CPF) savings have been "misappropriated", and alludes to wrongdoing by the Government. Mr Lee, in a letter of demand sent via his lawyer, also wants Mr Ngerng to remove the post from his blog called The Heart Truths and two Facebook pages. If Mr Ngerng does not comply by tomorrow, he will be sued for defamation. Yesterday, he put the letter up on his blog. 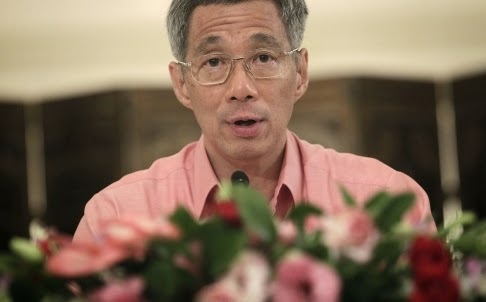 Singapore Prime Minister Lee Hsien Loong has demanded an apology from a local blogger for a posting seen as accusing him of corruption, Lee's lawyer said. Lawyer Davinder Singh wrote to Roy Ngerng Yi Ling on Sunday asking him to take down the original article as well as the links posted on his Facebook pages and to post an apology by Wednesday. Singh said the allegations by Ngerng in his May 15 blog post were "false and baseless". Roy Ngerng had on his website, The Heart Truths, posted a blog titled "Where your CPF Money Is Going: Learning From The City Harvest Trial." 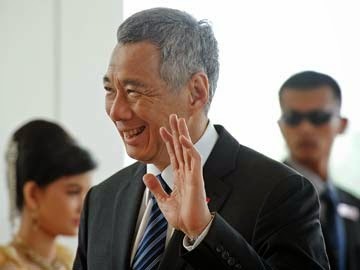 Singapore Prime Minister Lee Hsien Loong has sent a legal notice to a local blogger, demanding the removal of an article accusing him of corruption which had been "published maliciously", local media reported. Roy Ngerng had on his website, The Heart Truths, posted a blog titled "Where your CPF Money Is Going: Learning From The City Harvest Trial", which is understood to mean that Lee "is guilty of criminal misappropriation of the monies paid in the Central Provident Fund (CPF)". CPF is compulsory contribution from local workers and employers to a providential fund for the workers. The City Harvest Trial refers to a local church related fund management case in Singapore court. "This is a false and baseless allegation and constitutes a very serious libel against our client, disparages him and impugns his character, credit and integrity," the notice dated May 18 stated. The notice was issued by Senior Counsel Davinder Singh of Drew & Napier law firm, acting on behalf of Lee. Lee wants Ngerng to immediately remove the blogpost, publish an apology on the homepage of his blog for as long as the offending blog post was left online, and pay compensation for damages and legal costs. Mr Singh said the allegations by Ngerng in his May 15 blog post were "false and baseless". 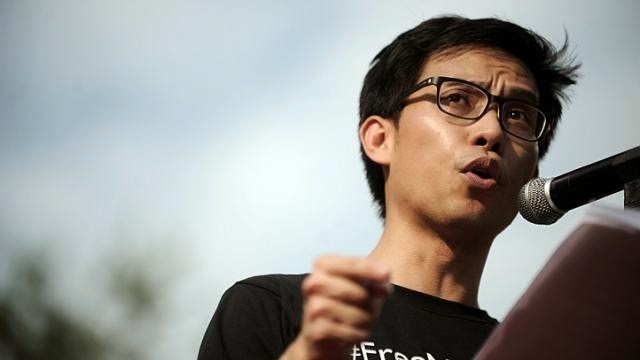 Blogger Roy Ngerng Yi Ling has been served with a letter of demand by lawyers for Prime Minister Lee Hsien Loong. The letter from Senior Counsel Davinder Singh, of Drew and Napier LLC, who is acting on PM Lee’s behalf, points to an article Mr Ngerng had written and published on 15 May. The article was titled, “Where Your CPF Money Is Going: Learning From The City Harvest Trial”. Singh said the allegations by Ngerng in his May 15 blog post were “false and baseless”. “The article means and is understood to mean that Mr Lee Hsien Loong, the Prime Minister of Singapore and the chairman of GIC, is guilty of criminal misappropriation of the monies paid by Singaporeans to the CPF (Central Provident Fund),” Singh wrote in the letter. GIC is a sovereign wealth fund that manages more than US$100 billion of the city-state’s foreign reserves. CPF is the state pension fund. 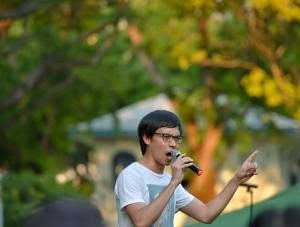 Healthcare worker Ngerng, 33, regularly posts commentaries critical of the long-ruling People's Action Party (PAP) in his blog The Heart Truths. Recent posts have called for greater transparency on how CPF funds are invested by the government through GIC and state investment firm Temasek Holdings. “My articles have been calling for greater accountability and transparency, and instead of acknowledging these issues, the prime minister has decided to sue me,” Ngerng told AFP. Dear PM Lee, I am shocked to learn that blogger Roy Ngerng has been served with a letter of demand by PM Lee’s lawyer on 18 May. Since Roy has alleged that CPF funds have been misappropriated, the government could have set the record straight with an INDEPENDENT audit of CPF Board and the GIC. The reason why speculation is rife is due to the opacity in the management of our CPF savings. What PM Lee should have done was simply inform Roy of the ‘serious mistake’ in his article to have it removed. This would have put PM Lee in a good light should legal action be subsequently required. 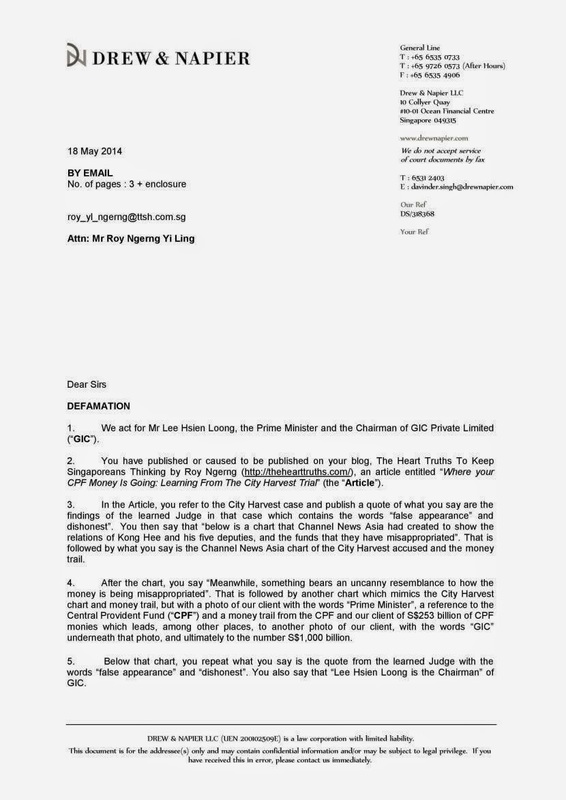 I was surprised to read that Roy Ng, who blogs at http://thehearttruths.com/, was served with a letter of demand from Prime Minister Lee Hsien Loong via his legal attack dog – Senior Counsel (SC) Davinder Singh. The letter is reproduced below (Ed: see Link). I did say I was surprised, although naturally legal letters and lawsuits have always been ‘par for the course’ in Singapore politics. Many people have formed the view that the ruling party (PAP) have used this ‘tried and tested method’ to silence its’ critics. The PAP and its supporters of course take the opposite view – lawsuits and the like are necessary tools to ensure that the truth gets out and irresponsible and inaccurate speeches, words, statements and writings are exposed and those behind it made to stop or brought to their knees. In fact Lee Kuan Yew earned his moniker ‘The Hatchet Man’ because he unashamedly said that he ‘carried a hatchet in his bag’ and would not hesitate to use it against those he perceived were out to destroy the PAP, in this instance to then Workers Party chief – J B Jeyaretnam. Who the hell is Roy Ngerng? Hello everyone, I am Roy Ngerng. I am an ordinary citizen in Singapore who believes in speaking up for my country and my fellow citizens. Over the past 2 years, I have written nearly 400 articles about what is happening in Singapore. I have advocated for a fairer and more equal Singapore where every Singapore and every person in Singapore can be taken care of and protected by our country. As of today, there have been nearly 2 million views on my blog. Today, I received an email from Lee Hsien Loong’s lawyer. I am being sued for defamation. I have tried my best to speak up for my country. I have tried my best to advocate for my fellow citizens. However, today, I am sued by the very government which should be protecting its citizens, such as me. This is disappointing. I have reproduced the letter that has been sent to me in this blog. The letter was sent by Davinder Singh from Drew & Napier. Best for Roy Ngerng to thrash it out in open court? – Anyhow Hantam: Is Asylum the Ulterior Motive for Roy Ng Defaming the PM? – Bertha Harian: Why can’t people be more polite? – Anyhow Hantam: Roy now wants to be a Nominated MP. Good or Bad Idea? – 5 Stars & a Moon: How else could PM have handled Roy “Sexispider” Ngerng? – Sam’s thoughts: Take a chance on him? Foreigners in our Midst: Xenophobia? Foreigners & PRs In 'Blue'? Turmeric: "A medicine cabinet in a curry bowl"